Muay Thai shorts are specially designed to provide comfort, style, and full body flexibility while you’re in the ring. Unlike traditional fighting shorts, those made for the skill of Muay Thai are significantly smaller. They provide a full range of motion, breathability, and comfort. While it may not seem like a huge deal, you’ll find that a great pair of shorts will let you do much more with your body without any hindrance. With Muay Thai’s full contact nature, you need to use every part of your body to make a strike. Ill-fitting shorts made for everyday wear or other disciplines will limit your movement, making the most effective moves impossible. Luckily, many Muay Thai shorts are available on the market. If you’re new to the sport and investing in your first pair, there are a number of things to consider. Manufacturers design these shorts with fighters in mind, but there are still many unique features that can ultimately affect your comfort and performance. To get you started on your search, here are five of the best Muay Thai shorts currently available. 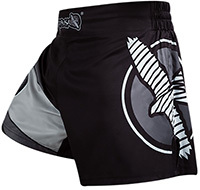 These shorts from Hayabusa have a great traditional design that looks great in the ring. Available in green or gold, the main design scheme features a bold dragon and the famous Hah Taew. In terms of construction, the shorts are made of 100% polyester. This allows it to remain cool and comfortable regardless of how much you sweat. The legs are quite wide to ensure that you can perform any kick or knee move without issues. There’s also a thick traditional elastic waistband that provides a snug and flexible fit. With its bold look, these shorts stand out. They feature a predominantly black design that’s accented with red and white stripes and traditional design. Made from 100% polyester satin, you can rest assured that you will remain comfortable. The shorts are soft to the touch and breathable. It’s also constructed with precision to achieve an anatomical fit. The shorts conform to the body for the best mobility possible. The waistband features the normal elastic bands to get the right fit. However, it also has a drawstring for extra security. The Brave Muay Thai shorts from Fairtex are designed with tradition and experience in mind. The shorts are made in Thailand from high-quality satin fabric. They’re also designed and constructed with input from highly experienced fighters to ensure that each pair of shorts is fit for the ring. They have the traditional Muay Thai cut that’s been used for centuries. It provides a full range of motion for moves of any skill level. An 8-strip elastic band makes it possible to get a snug fit that moves with your body. These shorts are a unique option for fighters that don’t necessarily want a traditional design. The shorts are a bit longer and fall to the middle of the thigh. They also have a slightly tighter fit. However, a slit on the side of each leg ensures that the shorts don’t restrict your range of motion as you kick. The fabric used is light and breathable, allowing you to maneuver with ease. There’s no hardware to fasten the shorts. Instead, Hayabusa utilized a unique hybrid elastic waistband and drawstring. 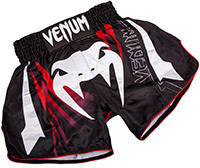 With its lower price tag and superior design, these shorts from Venum are great for any fighter. The shorts are made in Thailand from 100% polyester satin. This material makes the shorts lightweight, breathable, and very strong. The wider leg opening is paired with side vents to increase your mobility. This unique system allows you to make more dynamic movements as you fight. The shorts look great and feature the bold Venum logo. The color and design are sublimated into the fibers to remain vibrant for many years to come. Fighting shorts come in a variety of styles based on the particular discipline. To an outsider, these shorts are just items of clothing. However, subtle differences in design make them suited to particular disciplines. Typically, fighters will wear the style of shorts that corresponds with their style. Some other styles include MMA and boxing. As mentioned earlier, Muay Thai shorts are designed to be significantly shorter than other fighting styles. This is to allow freedom and movement. Additionally, the fighting style originated in Thailand. Shorter designs promote airflow in hot and humid environments to improve comfort. Boxing shorts are quite long and often fall to the knee or lower. They sit higher up on the body. This is because boxing doesn’t require significant leg freedom like Muay Thai. The same goes for MMA shorts. While they’re shorter than boxing shorts, they’re still longer than needed. Not only that, but MMA shorts tend to have a tighter fit that can restrict leg movement. Muay Thai shorts are small, baggy, and perfect for fast-paced action. While fighters can certainly wear other types of shorts, their performance is not going to be the same. Both boxing and MMA shorts cover more of the leg and are made from materials that aren’t conducive to action. To get the best results, stick with the style that fighters have been using for centuries. There are a number of things to consider on your search for that perfect pair of Muay Thai shorts. While style is undoubtedly an important factor, you should always go for quality and comfort first. Muay Thai shorts are a unique piece of gear that serve a specific purpose, so it’s important to examine each option closely. Most Muay Thai short manufacturers use a sizing system that you may be unfamiliar with. Options are often labeled in Thai sizing even if the product is being sold internationally. Thai sizes tend to be much smaller than those in Western countries. As a result, you should never pick up the size you’re used to. The standard size you normally wear can be two to three times smaller in Thai sizes. For example, if you wear a large in American sizes, the appropriate label for you will be closer to 2XL in Thai sizes. Instead of guessing, it’s important to take proper measurements. Most manufacturers have sizing charts that make it easy to get the perfect fit. Sizing charts display the length of the short, the width, the waist, and the crotch. Some charts even include weight ranges that are commonly used for a particular size. Of course, variations in the sizing chart will occur from brand to brand. When finding the right pair, get out your measuring tape to ensure that you know what to look for. The fabric used on the shorts plays a big role in its overall comfort and durability. While a lower price tag may be enticing, it often indicates inferior materials. Muay Thai shorts should be made from high-quality satin or silk satin. Manufacturers will often use one of four different types of satin to achieve a smooth and light feel. These different types of satin have their own unique properties in terms of durability, maintenance, and feel. Acetate satin is soft, easy to care for, and resistant to mold. They can be made into a number of vibrant colors and are very soft to the touch. Nylon satin is known for its durability. It’s resistant to moisture and dries quickly. Polyester is one of the most popular options because of its resilience. It’s not prone to wrinkles, resists chemicals, rarely shrinks, and holds up well to abrasive damage. The most sought-after material is silk. It’s the most comfortable option because it stays cool, absorbs moisture, and insulates the body. However, it’s very delicate and requires great care to maintain. Any of these fabric types are great for Muay Thai. Satin and silk satin are used because of their ability to keep you cool. They’re smooth and stay cool even when you start to sweat. Be weary of shorts that are made of cheaper materials. They can feel papery and even rip after only a few uses. While it may cost a bit more, it’s always good to go with fabrics with a higher percentage of quality satin. There are a number of brands out there. Not all Muay Thai shorts are made to the same standards of quality, so it’s good to know which brands continually produce great products. The following brands are all heavy hitters in the world of Muay Thai for creating quality shorts that are comfortable and effective. 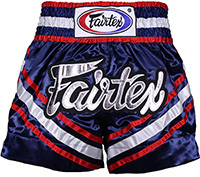 Fairtex is on the higher end of the price spectrum, but these shorts are highly sought after by fighters. Shorts are made in Thailand and utilize high-quality satin. They provide a wider leg than other brands for improved flexibility. The brand also uses an 8-strip elastic band for security without sacrificing mobility. Hayabusa is a great brand that fuses tradition and technology into something unique. 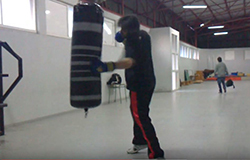 Their Muay Thai gear is designed to be comfortable and efficient for fighting. They utilize great materials to ensure that you stay cool and collected in the heat of the fight. Boon shorts are known to last for quite a long time. The brand uses superb materials and has different ranges of products. Their 100% satin Muay Thai shorts are popular amongst athletes. The shorts are simple in design but incredibly effective. Venum is relatively new, but that doesn’t mean they provide any lesser options. The Muay Thai shorts are all handmade in Thailand and designed by experienced fighters. With their affordable price tag, it’s a great option for those that want a top-notch pair of shorts without breaking the bank. Choosing Muay Thai shorts for training and fights doesn’t have to be difficult. By knowing what to look for, you can choose a pair of shorts that are comfortable to wear time and time again. As you gain experience, you’ll have a better understanding of what works with your particular skills. A great pair of shorts will allow you to reach your full potential within the sport as you fight in style.